S T A R T H E R E 2 0 1 8 S o, you want to start a screen printing business? 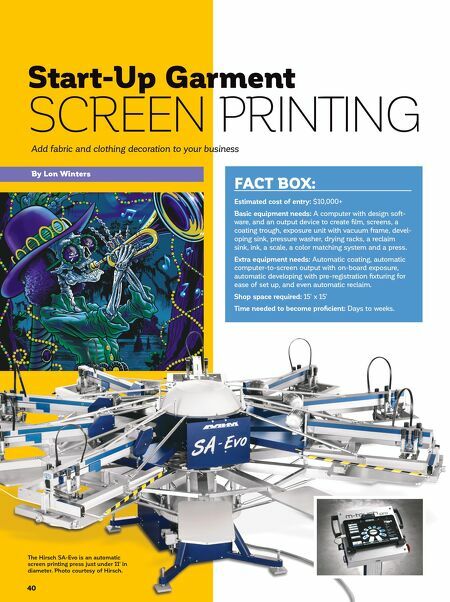 The garment screen print- ing business is a multibillion dollar industry, and it can be relatively inexpen- sive to start a small operation. Yet, many people don't understand what it takes to get started. On top of that, the learning curve is often discovered after the purchase of expensive equipment. But, starting a screen printing business is possible with planning, the right equipment, and knowledge. The Basics As you might imagine, there is more to making it in business than just the screen printing itself. The first step to developing a business plan is to take time to think critically about your idea and entrepreneur spirit. Ask the critical questions: why, what, how, where, and who? The what is usually not the hard part. The what is the screen printing or decorating itself. It's important to be able to describe how you are or will be different. Why is a little harder to put your finger on. Why is not necessarily about money or profit but the thing that inspires us and those around us. 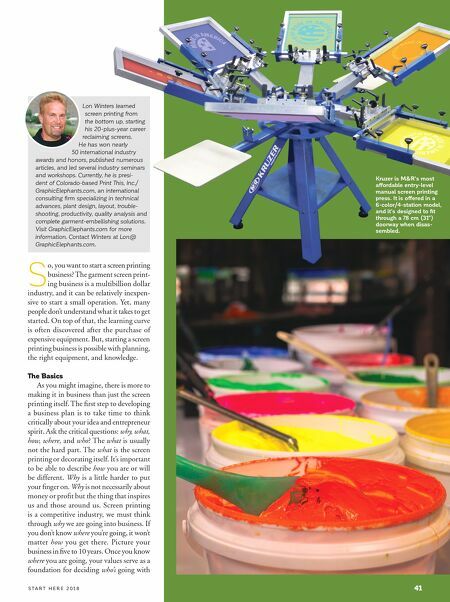 Screen printing is a competitive industry, we must think through why we are going into business. If you don't know where you're going, it won't matter how you get there. Picture your business in five to 10 years. Once you know where you are going, your values serve as a foundation for deciding who's going with Lon Winters learned screen printing from the bottom up, starting his 20-plus-year career reclaiming screens. He has won nearly 50 international industry awards and honors, published numerous articles, and led several industry seminars and workshops. Currently, he is presi- dent of Colorado-based Print This, Inc./ GraphicElephants.com, an international consulting firm specializing in technical advances, plant design, layout, trouble- shooting, productivity, quality analysis and complete garment-embellishing solutions. Visit GraphicElephants.com for more information. Contact Winters at Lon@ GraphicElephants.com . 41 Kruzer is M&R's most affordable entry-level manual screen printing press. It is offered in a 6-color/4-station model, and it's designed to fit through a 78 cm (31") doorway when disas- sembled.